Sort of. Here's a fun experiment. Today, I wanted to quickly send a URL from Chrome for iOS -- my default browser -- back to Safari. I know there are ways to do Safari-to-Chrome, but I wanted the opposite: from Chrome back to Safari. I needed to install some custom Mr. Reader actions, and Chrome was giving an error when tapping on the downloadable files. I figured I could make a bookmarklet to take the current webpage in Chrome and send it to Safari. ...simply opens a new tab in Chrome. What I ended up using is a hack -- and a very curious one -- to leverage Chrome's support for x-callback-url to open a link back into Safari. I was inspired by Cormac Relf's script, which I discovered yesterday when he showed me another script he made for Pythonista. As you can see above, we're telling Chrome to open a new tab using...itself. The trick, at least theoretically, is to use an encoded location.href string to call back Safari, which is registered for the http:// scheme that Chrome, in this case, opens "externally". Displaying x-source is needed per Google's URL scheme specification; the name you give to x-source will be displayed as a "back" button in Chrome (as shown in the image above). A wild new tab appears! Tap the Safari button. It's super-effective. Safari will launch the link, closing the additional tab Chrome decided to open. My conclusion is that we have three solutions: a) it's not possible to create a straightforward Chrome-to-Safari bookmarklet; b) it's possible in another way that I haven't explored; or c) it's possible with the x-callback-url hack, but in a different way. If you have ideas, ping me on Twitter. Tom Witkin's Poster is my favorite WordPress blog editor for iOS. Poster comes with a clean interface, support for Markdown (the app can convert plain text Markdown to HTML before publishing), and full WordPress integration. The app's excellent support for WordPress features like custom fields, drafts, slugs, and images means I don't have to write on the iPad and later "adjust everything" on a Mac before publishing. Poster is, in fact, a core aspect of my iOS automation workflow. Poster 2.0 is out today, and it's another fantastic update that reassures me Tom is committed to making this app the best WordPress editor for iOS. The interface has been further refined, and it's now easier on the eye with an even deeper focus on content rather than UI chrome. I don't use these for MacStories, but Poster now supports WordPress custom post types and excerpts, alongside the "sticky" functionality that we use every once in a while to pin a post to the top of the site. What I like about Poster 2.0 are the "minor" additions that make for a much better workflow. Custom fields can now be given a local label so that a friendlier name will be displayed in Poster instead of the actual name (e.g. "URLCustom_linked" becomes "Linked post"); the Markdown preview and HTML conversion now handles en and em dashes (something that annoyed me in the previous version of the app); if you edit a published post (as we usually do when we catch typos or make corrections), you can now save the edited draft locally before publishing. I also appreciate how the "Copy to Clipboard" action now only received a post's URL (Poster 2.0 builds on the solid foundation of Poster 1.0 for post sharing), and the app is noticeably faster at syncing multiple posts at once. There are two more changes I want to mention. You can now insert images at any point in the editor by tapping & holding and selecting the "Insert Image" option from the popup menu; I tend to do all my image insertion beforehand, but this is a welcome addition for those times when I may forget about an image. And last, Poster now supports Greg Pierce's x-callback-url to return to a specific URL after completion. Poster already had support for a URL scheme that allowed post creation from other apps, but now you'll also be able to create a post and return to another app. Here's a bookmarklet I made to grab a browser's selection and use it as text in Poster, get a webpage's title and use it as post title, open Poster, and return to the browser. This kind of URL callback enables a streamlined workflow for, say, discovering links in Safari, quickly posting them to WordPress, and going back to Safari again. I also made a quick video showing the process in action. Unfortunately, getting the browser's selection only works on the iPad. Poster is a great app, and while not revolutionary, the 2.0 update refines several aspects of the previous version and adds more powerful functionality for WordPress users and iOS automation geeks. I highly recommend it. Ever since upgrading to Safari 6 and Mountain Lion, I've noticed the OmniFocus bookmarklet I had installed stopped working properly. The OmniFocus bookmarklet is a handy addition to my workflow, in that it allows me to quickly save webpages I need to act upon at a later date, while preserving their title, link, and text selection. I often do this for linked posts that end up here on MacStories, or pages that I need to check out but that I'm not ready to bookmark yet (for that, I use Pinboard). In theory, the OmniFocus bookmarklet should be capable of grabbing a webpage's URL and selection (if any) as a note. However, of the two bookmarklets provided by The OmniGroup, none of them manages to successfully grab text selection on my machine running Safari 6 and OS X 10.8.1. So I set out to find a better bookmarklet, and I found this version by Alex Popescu that, besides working correctly, has also some nice integration with Gmail. For Gmail, the bookmarklet creates a new task with the email title as the task title and a note with the current selection (if any), plus a from line in the form: From: email subject:(email subject) email_thread_url. For normal web pages, the bookmarklet creates a new task with the document title as the task title and a note with the current selection (if any), plus a from line in the form: From: page_url. I tested this on Safari 6, and it works as advertised. The bookmarklet also works on iOS devices, albeit the iPhone's Mobile Safari can't send the current text selection from a page to OmniFocus. Tap-Translate, a $1.99 universal app by developer Ronen Drihem, brings an interesting approach to translations on iOS, and more specifically in Mobile Safari. Tap-Translate, in fact, isn't exactly an "app": it's an app whose only function is to let you install a bookmarklet in Safari that will let you tap on a word on any webpage to get an instant translation inside a cute yellow popup menu. It works like this: once you've followed the steps provided by the app to install the bookmarklet (which allows you to choose from a variety of languages), you'll find the bookmarklet in Mobile Safari (works on any iOS device, but I've also tested it in Chrome and Safari on the desktop) ready to give you inline translations on tap. 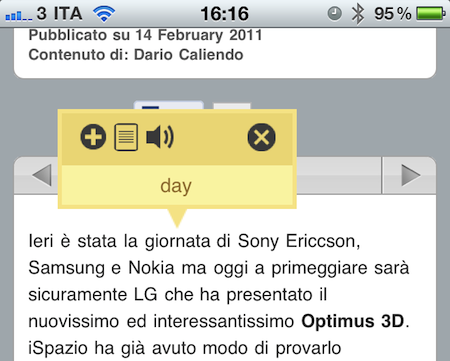 The translation's popup allows you to "speak" a selected word, or jump directly to the Google Translation page. Tap-Translate can also do entire paragraphs, and be dismissed at any time. It's fast, easy to use and convenient. At $1.99 you could argue you're spending money to install a bookmarklet. The thing is, Tap-Translate works really well and, most of all, it's integrated with Safari and it's unobtrusive. Recommended. This one's a useful bookmarklet you can use in your default browser to send the current webpage title and link to Twitter for Mac. Works great -- too bad Twitter for Mac doesn't offer a way to wrap links in your own shortener instead of the not-so-popular t.co. Most of web video has been optimized to display just fine on iOS devices, but it's still annoying to open an article from your favorite blog and find out that the author didn't use Vimeo's updated embed code compatible with the iPhone and iPad. Vimeo offers a new embed technology to support iOS devices, but it's not turned on by default. Just like Vimeo, other services such as Flickr, Megavideo and Dailymotion sometimes struggle in offering video embeds capable of being displayed on Apple's mobile devices. The Skyfire browser has been making the rounds recently: an iPhone app that can take any Flash video from any web page, and convert it in seconds to an HTML5-based video you can watch on the iPhone. The app is paid though, and perhaps many users don't need all of its functionalities. Then, some developers even released tweaks and hacks in Cydia to activate Flash on iOS -- with very disappointing results, I have to say. Put simply: either you jailbreak your device to sorta gain access to some Flash content on the web, or you buy Skyfire to convert Flash videos. But there's no easy way built in Mobile Safari to play that Vimeo embed on the iPhone.